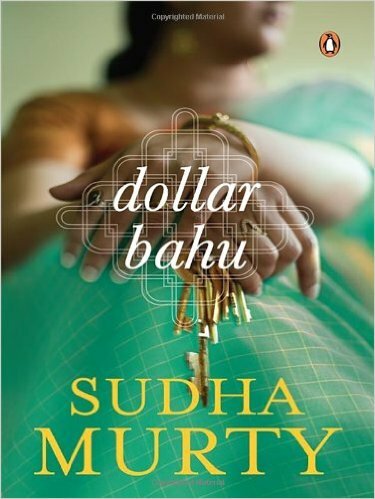 Summary: There’s a difference between spoilt and rightly bred, need and want, loved and possessed, enough and excess and, lastly, real and pretender and Sudha Murty has tried to bring this to light through her book, Dollar Bahu. A clear-cut fiction with no real plot twists, predictable story and easy language all make it a rather bland read. What really clicked? The title. I was expecting way more than what it has actually offered. My take: Bheemanna (one name that comes handy to the author) and Gouramma have three kids: comfortable-with-life Girish, overambitious Chandru and greedy-as-wolf Surabhi. Chandru, on one of his business trips to a small village, Dharwad, falls in love with Vinuta, but never gets to express his feelings. Working up his way up the corporate ladder, he gets a lifetime chance of working in the US and puts Vinuta off his priorities. Back in India, Bheemanna leads a frugal but content life with his family – a son and a daughter and a wife who always dreams of counting herself in the elite club of the society. In fact, she looks up to her son, Chandru, for fulfilling all her desires, as her other son, Girish, is more like his father, happy-in-little. Bheemanna fixes marriage of Girish with Vinuta, who now works as a teacher in a government school. Chandru, being busy in corrupt ways of getting a green card, sends money as a compensation for his absence. The story progresses, Chandru comes to know about Vinuta and Girish and finds the reality hard to grasp. He ends up marrying Jamuna, who is a spoilt daughter of a filthy rich businessman. Gouramma, weighed down by money and gifts, can’t stop praising Jamuna and completely ignores all the efforts put in by Vinuta. Jamuna follows Chandru to US and, hence, aptly claims the title of the book, Dollar Bahu. The author has tried to highlight the contrast in life people face when they go to US from India for the first time and how life becomes bland after some time. She also describes India as “swelling crowds, dustier, dirtier streets, hectic construction activity all round… Pollution in the air, in the water, in the food…” when compared with the US. The story moves on to making stark revelation in the lives of people living in the US and earning in dollars and their roles in their families living in India. It also hurriedly closes down to talking about random people coming into the picture just to talk about their stories. Gouramma, having spent close to one year in the US and realizing the true colors Chandru and Jamuna misses home, her husband and Vinuta. On her way back home from the airport in India, she comes to know that Bheemanna has sent Girish and Vinuta to live in Vinuta’s hometown so that they be spared by Gouramma’s constant comparisons and harsh taunts. Gouramma is left with a deep remorse for her behavior towards Vinuta all this while and she expresses her desire to meet them at the earliest. The story is left open-ended for the reader to conclude it in a way they find appropriate. The story not only puts forth the natural behavior Indians have towards dollars, but also towards the people who live in the US and earn them. All the characters, except for Gouramma and Jamuna, do not have a significant role to play in establishing the story. The book, more or less, rests on random accounts of people who live abroad. There isn't a point to prove per se, but Sudha Murty tries to highlight how we shouldn’t blindly look over people’s behavior towards us and eulogize the ones with more money. The cover, too, speaks aloud how the one who has more money gets to hold the ‘golden’ keys of the home. Final word: This would probably be the first Sudha Murty book which lacked the enthusiasm that holds the content together. In fact, the content gets too cluttered, confusing and hurried up towards the end. True, the book more looked like a fable with only shades of black and white, leading to a conclusion left open-ended for the reader to cook up. The brief read would surely compel you to put it down after initial 50 pages giving in to the predictable end, but love for the author might drag you to the last page.